"On foot or by bicycle, alone or in company. La Vall invites you to discover its reoutes and you to discover yours". 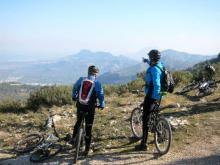 The Vall de Pop MTB Centre is based in Parcent. Vall de Pop is a place where history and nature have joined forces to create a uniquely distinctive landscape. Starting from the Vall de Pop MTB Centre in Parcent, you can take an exciting ride on your MTB bike into the mountain ranges of Serrella, Aixortà, Bérnia, Cavall Verd and Carrascar, past villages, country farmhouses and old Moorish settlements, through places where terraced vineyards and almond groves keep the centuries-old art of dry stone walling alive. The Vall de Pop MTB Centre can provide a total of nine routes of varying difficulty and covering a total of 260 kilometres. The routes start from various points, including Castell de Castells and Benissa. Route 9 takes you down to the sea, to the town of Denia, where there is an information point.